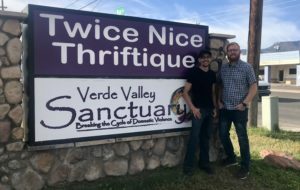 The Verde Valley Sanctuary is proud to announce the grand opening of Twice Nice Thriftique’s new location at 297 South Main Street in Cottonwood. The community is invited to the Grand Opening Event on Friday, November 2nd from 11 am to 2 pm. Guests will enjoy food and music in the garden, special store discounts and raffles. The new store has a total of 6400 square feet of retail and storage space with plenty of room to display top quality furniture, jewelry, housewares, and clothing. 100% of the proceeds from the store support the operations of the Verde Valley Sanctuary, which provides free support services to victims of domestic abuse and sexual assault. The store also serves as a resource center for clients, many of whom had to abandon their belongings in order to stay safe. “The outpouring of support from the community on this project has been truly humbling,” states store manager, Tony Meili-Petzoldt. Volunteers from the Verde Community Church, Home Depot and Behr Paint all pitched in to help get us ready for the grand opening. The hope is that the new revitalized garden will serve as a place for the community to gather and hold events. The Verde Valley Sanctuary operates two Thrift Stores, Twice Nice in Sedona and Twice Nice Cottonwood. Supporting these operations is easy, you can shop at either store six days a week, donate your unneeded items or volunteer in the store. For complete details visit www.VerdeValleySanctuary.org or call the store at (928) 634-7555.